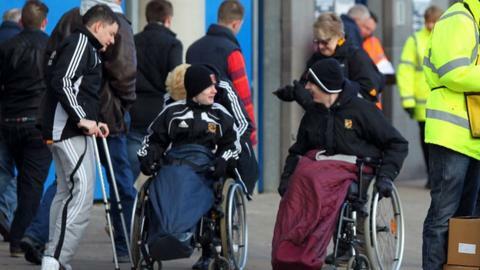 A new survey has suggested that many Premier League clubs are continuing to fail disabled fans. Only Bournemouth, Swansea and Arsenal have been found to be 100% compliant with Uefa recommendations for wheelchair spaces at their grounds. Tottenham are bottom of the list with 28%, behind Watford (35%) and Aston Villa (41%). The survey was carried out by charity Revitalise before the start of the new Premier League season. It follows a BBC Sport investigation in March 2014 which highlighted the issue. In June, top-flight clubs were threatened with legal action after the Equality and Human Rights Commission (ECHR) said it had received a number of complaints about clubs, including Manchester United removing walking aids from away fans. Other examples received by the ECHR include disabled fans being prevented from obtaining season tickets, and problems such as families with young disabled children being unable to sit together at matches. Guidelines on how football clubs in the UK should cater for disabled spectators have been in place since 2004, while European football governing body Uefa's recommendations were published in 2003. The number of wheelchair spaces a stadium should provide is based on its capacity. Last month in the House of Lords during the second reading of the Accessible Sports Grounds Bill, Lord Holmes of Richmond, Britain's most successful Paralympic swimmer, called on Premier League sponsors and broadcasters to pull out of football unless progress was made in providing facilities for disabled fans. If enacted into law, the bill would give local authorities the power to refuse to issue a safety certificate to a sports ground which does not comply with accessible stadia guidelines. Is Premier League failing disabled fans? Read more on BBC investigation: Is the Premier League failing disabled fans?